There should be a law against anyone who is so strongly connected to any political party saying that they are independent. Esakoff is tied by a umbilical cord to Lipshutz and Hyams 95% of the time. Why, its better to know how low the real person will stoop to. I think she has also use a backed dated photo of herself. Jack and Margaret are back door knocking, glad handing, telling all those who take no interest in municipal affairs how important her experience is to Council. She should never have been eligible for re-election after been part of the disgraced and sacked council. Same applies to Hyams. Being a Councillor must be a lucrative full-time enterprise these days. No one should be able to serve more than two terms in my view. Bluffing the public will hopefully catch up with her. If public are falling to this advertisement then we are bloody fools as she and other Councillors think that they know what is good for residents. No windows for the prison like developments in Carnegie. Diverting attention to sky rail to cover up mess in supporting the pigeon box rooms. She’ will pick up the large proportion of jewish vote across the ward, there will be no doubt about that. That’s why Jack is out there knocking the doors to reinforce that link. It’s organising the Jewish vote that ensures the re-election of Esakoff and Lipshutz due to there being such a high proportion of Jewish people in those wards. Not sure that’s the case with Hyams ward so how this failed, once sacked and duplicitous individual gets re-elected mystifies me. Councillors should be voted in based on merit and values and not what religion they are. How can she claim to be Independent when she always votes with the Liberal group? must be on the back of her fictional flyer. Disgrace big times. Carnegie residents should think million times before voting people who have destroyed our once much loved neighbourhood. 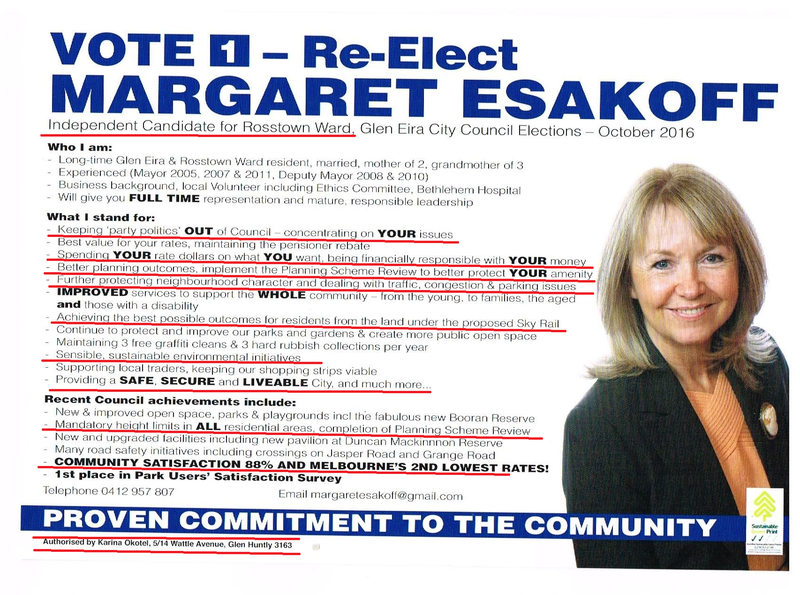 Do the residents know that Esakoff has moved from Rosstown to some other ward. Will she really be of help to the residents of Carnegie, Murimbeena, a Glen Huntly? No sense of shame in any of the promises. The icing on the top comes with Okotel’s authorisation. Not bad for someone claiming to be independent. It is worse than a joke. It is an outright lie. “spending your rate dollars on what you want”. They spend it on useless and unwanted things that nobody wants and costs a fortune like gesac and car parks instead of trees in parks and getting rid of the conservatory after 3 rounds of consultation where they were told to keep it. What people want doesn’t matter to Esakoff and her friends. It’s what they want and that’s it. She has been a useless councillor.